ABC Radio Host Sarah Macdonald interviews author Christine Kohler about Shoichi Yokoi in this 30-minute broadcast. Yokoi in Guam Memorial Hospital in 1972 after he was found by shrimp trappers. NO SURRENDER SOLDIER is a novel I wrote out of curiosity of how and why a WWII Japanese soldier would hide in the jungles of Guam for 28 years. (See blog articles "Eureka! A Novel Idea" and "Nonfiction, the Bedrock of Fiction".) I based the story of Isamu Seto on the true life story of Shoichi Yokoi, the WWII soldier who never surrendered. Yokoi’s story began August 5, 1941, when he was drafted into the Japanese Imperial Army. Shoichi Yokoi, the son of tailors, was drafted into the Third Supply Regiment for temporary duty. During World War II, Japan allied with Germany and Italy. Japan invaded China, Southeast Asia, and many Pacific Islands. Hours after Japanese pilots attacked Pearl Harbor on December 7, 1941, Japanese forces attacked Guam, which was a United States territorial possession. Three days later, Japan occupied Guam. During the two years and eight months Japanese soldiers occupied Guam, they committed many atrocities against the people. Most of that time, Yokoi was not stationed on Guam. It was not until March 4, 1944, that Yokoi arrived on Guam from Manchuria (China) and was assigned to the supply unit at Talofofo Camp. U.S. Marines liberated Guam July 4, 1944. Germany surrendered May 7, 1945. Japan surrendered August 14, 1945. But for Yokoi, the war did not end. Why didn’t he surrender to the American soldiers and go home to Japan like most soldiers who chose not to commit suicide? I studied news articles written and translated from Japanese into English to read what Yokoi himself had to say about his long ordeal hiding in the jungles of Guam. As near as I could figure, he was filled with fear and shame. Japanese soldiers at that time believed their emperor was a god. They were taught that if they were captured they would be severely tortured by enemy soldiers, and if they did not die in battle, or commit suicide, they greatly shamed their families. Yokoi was a survivor, at all costs. So when the U. S. soldiers liberated Guam, he hid in the Talofofo jungle with two other Japanese soldiers, Mikio Shichi and Satoru Nakahata. At first they hid in natural caves in the rolling mountains in Southern Guam. Later, they built separate huts within the jungle. 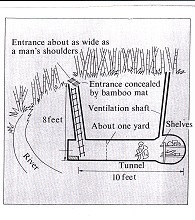 But as Guamanians built new houses closer to the Talofofo River, the two soldiers moved to a cave and Yokoi dug a tunnel eight feet underground, and ten feet long. In 1964, Shichi and Nakahata died, possibly of poison. Only Yokoi remained as the last straggler, a term Guamanians called soldiers who never surrendered. On January 24, 1972, Jesus Duenas and Manuel DeGracia found Yokoi while checking shrimp traps in the Talofofo River. Yokoi could still speak Japanese and halting English. He told authorities and reporters how he survived for twenty-eight years in the jungle, the last fifteen years underground. The only fact that has been disputed is whether, in 1950, Yokoi took part in the murders of the two young men, one the brother of Jesus Duenas. When Yokoi was first questioned he admitted to being a participant when his comrades murdered Francisco Duenas, 15, and Jesus Pablo, 26. However, later the Japanese government denied Yokoi had anything to do with murdering the two Chamorros. After Yokoi returned to Japan he was given a hero’s welcome, promoted to sergeant, and married. He died September 22, 1997, in Japan at age 82.